Fast & Furious (2009): Have you ever been over at someone's house when someone is playing a single-player game on X-Box? This film is about as exciting as watching someone play a video game: mindless, mildly entertaining, totally unrealistic, and shallow storyline. Reuniting the cast from the first film, the movie opens with an intense truck heist on the same level as the original. It's a bit confusing beyond that, but you're not watching this for the storyline. Dom Toretto (Vin Diesel) and his girlfriend Letty (Michelle Rodriguez) are using their driving skills to steal stuff still, until Dom goes on his own to avoid capture by the authorities. When the death of a loved one brings him back to Los Angeles, he finds himself in the same race as Brian O'Conner (Paul Walker), the then-cop, now-FBI agent who let him go. Turns out that they're looking for the same drug lord who uses fast cars to drive his drugs over the Mexican border. Much of the story is filled with plot holes or is fairly uninteresting. (eg. the drugs are transported through a mountain tunnel on the heavily monitored Mexican border; how'd the enormous tunnel with mechanical door get built when there's only a 45 second window for a car to get past the authorities?) The race sequences do their best to make up for the plot, but the increased use of CGI and the need to push the limit for the audience brings me back to my video game analogy. The film also paints a low view of humanity: guys are meant for acting tough and driving cars, while girls are only good for eye-candy standing next to the guy's car. 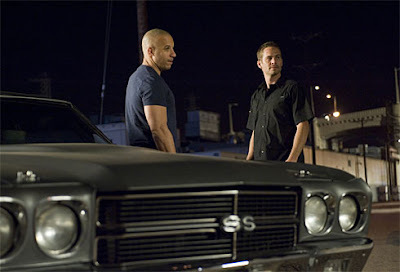 As for performances, Paul Walker overacts while Vin Diesel underacts, creating an awkward tension throughout the film. Diesel seems like he's taken a sleeping pill before every scene and has the stunted vocabulary of a 4-year-old, preferring long glares to full sentences. But really, this guy wasn't cast in the film for giving eloquent speeches. I watched the film in Big Bear, CA with two youth ministry friends during a trip to a summer camp. It served its purpose of spending 90 minutes having some mindless entertainment and getting us out of our cabin. Fast & Furious is exactly what you'd expect from the fourth film in a mediocre car-racing series. Save it for a rental, or just go play some X-Box. Religulous (2008): A mostly humorless documentary about the crazy side of religious beliefs, comedian and atheist Bill Maher goes all over the world to poke fun at people who believe in God. From televangelists to truck drivers to Islamic extremists to ex-Mormons and Jewish fundamentalists, Maher uses his quick wit to make fools of everyone he interviews. In the same vein as Michael Moore, Maher comes with an agenda and uses blitz interview tactics and false pretenses to get interviews with folks to make them look like idiots. The sad part is, he doesn't have to do much to get them there. If you're looking for an objective discussion about the beneficial and harmful effects of religion, this isn't it. Maher doesn't seek out scholars or seem to want to have a balanced dialogue. He finds the uninformed fundamentalist, the person on the street, the guy claiming to be the second coming of Christ, and the dude playing Jesus in a trumped-up Christian theme park. I'd think these people were kinda nuts too. The only scholarly person Maher interviews is Francis Collins, head of the human genome project and proponent of theistic evolution. Instead of talking about how faith and science can be reconciled, Maher asks Collins about New Testament historicity and the authorship of the Gospels. Collins gives decent answers, but Maher clearly isn't out to find coherent and intelligent thought from those in the religious community. The film is a bit scattered, lacking a storyline and made up of disconnected sets of interviews. I've gotta admit, I agreed with Maher on a number of his points. Having rich televangelists wearing $3,000 suits and asking for more money from poor parishoners isn't part of Jesus' kingdom. Nor is Islamic fundamentalists who want to kill the infidels and promote a culture where women are inferior to men. I don't want to be placed in the same category as the folks creating the Creation Museum or the people doing choreographed dances at The Holy Land Experience. But I also don't think that because some people are weird or misinformed that belief in God should be completely tossed out. I'm sure that there are atheists and agnostics who are ignorant about matters of faith and science, who've made poor decisions in their life or don't have it all figured out. There are countless intelligent and informed people throughout history who believe in God, much more than would claim to be atheists. Maher's point that religion has done nothing but harm to society is simply false. Martin Luther King, Gandhi, William Wilberforce, and Mother Theresa have all impacted history in a positive and beautiful way. Maher lays his cards out on the table in the final moments of the film, basically saying that belief in God is the equivalent of a brain disorder and organized religion is leading to the end of the world. For a guy promoting doubt, he sounds fairly certain to me. Amusing only in brief moments, Religulous is a mostly snark-filled tirade against faith with an arrogant host. I really wanted it to be more interesting and thought-provoking, but it simply wasn't. Maybe I'm just not Bill Maher's fan base.